Finally starting to feel experienced enough to start a planted discus tank. I hope to be making more posts in the near future as the tank starts to take shape. I'M BACK!! I know I haven't been around recently but I've started a new job with a new schedule that has taken some time to get used to. I hope to hear from all of you soon! Oh yeah? Small world! I'm new to the whole fish thing, have only had my tank for a few months. We got the tank to keep the cats entertained, and it's definitely worked! Thanks for reaching out to say hello. I'm sorry about your loss. I hate it when a fish dies without any signs of illness or injury. It's a very helpless feeling. Now for something more positive. I have Guppiy questions. I'm setting up another 55g tank, we've decided on 2 Platinum & 2 Black Veil Angels. But, we want more than just 2 pair of Angel fish. Someone suggested Tetras but, many of them are fin nippers, not a good match for the Angels. I saw these incredible Fancy Guppies. So I was wondering if you know anything about, Blue Neon Tux and Purple Dragon Guppies. I felt that their bright colored little bodies swimming around the Platinum & Black Angels would be a beautiful contrast. And how many should I get? hey! yeah they're great! But mine got a bact. infection a few weeks ago and didn't make it. He was a great fish too, always greeting me at the front of the tank. Cool! Didn't even know they had screensavers on there. Thank you for the friend request. I'd be happy to. have the same Plants in my tanks. The Green is in my Cichlid tank and the one that looks purple is in the tank I'm cycling now. 29 gallon freshwater tank: tropical fish (mollies, krebensis, neon tetras, giant danios, zebra danio, platys, apple snail, peppered corys), live & artificial plants, 1 topfin 30 filter, 1 Penguin Bio-Wheel 200 filter, airstone. 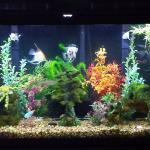 60 gallon freshwater tank: (angel fish, red dwarf gouramis, australian rainbows, boesemani rainbows, harlequin rasboras, neon tetras, cory cats, apple snails), 2 penguin Bio-Wheel 350 filters, 2 airstone, live & artificial plants. "Humility is the clearest indication of strength". Sure wish I was humble ! Ultimately, experience is the best teacher.